Jakarta (B2B) – The Indonesian government appreciates entrepreneurship education for students in the 5th Unesco-APEID Meeting on Entrepreneurship Education organized by the UNESCO with Jakarta’s Bina Nusantara University and Bandung’s Padjajaran University to develop entrepreneurship education in the Asia Pacific region, especially in Indonesia for improving the entrepreneurial spirit. 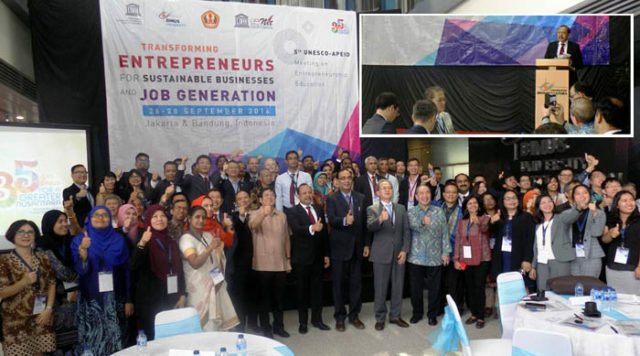 “The Indonesian Cooperatives and SMEs Ministry support implementation of entrepreneurship education to students so as to encourage the spirit of innovation and creativity of the students,” said in his speech here at the opening of 5th Unesco-APEID Meeting on Entrepreneurship Education on Monday (September 26). According to him, entrepreneurship becomes important and strategic issue amid growing global competition as a challenge for all businesses in Indonesia, including the younger generation as future entrepreneurs. The UNESCO delegates Prof Shahbaz Khan said the purpose of the meeting for discussion on strategic issues develop entrepreneurial transformation as a provider of employment, with a focus on the transformation of job seekers as employers. “This meeting refers to the fact that the Asia Pacific region which is inhabited by 60 percent of the world’s population aged 12 to 24 years,” Prof Khan said. Mr Muharram noted the challenge of future economic growth is unemployment and poverty, and entrepreneurship as a priority choice for students.